From a seated position extend one leg diagonally out. Stretch sideways towards the extended leg. Try to keep the body aligned sideways or twist a little more so that the chest faces upwards slightly. The arm on the stretched side of the body stretches out or if your flexible grab the foot. Take the other arm behind you and grab the foot. For a deeper stretch point the foot of the extended leg while holding it. Lengthen the back of the extended leg as much as possible. This can be quite challenging and may have to be done after the body is warmed up or after some time in the pose. The extended leg has a tendency to rotate outwards. Be aware of this and try to keep the toes vertically aligned for good form. However you will be able to twist more if you allow the leg to rotate out a little. If the leg is rotated out a lot you can get a good stretch on the iliotibial Band. Internus and externus oblique areas are stretched. These are the sides of the abdominals and deep low back muscles such as the quadratus lumborum which is stretched on one side and strengthened on the other. This muscle Hamstrings, lower back muscles and shoulder muscles are also stretched. If the toes are grabbed on the bent leg it is hard to rotate because the shoulder hits the leg. It is a slightly different stretch when you allow the body to tilt in slightly rather than directly aligning the shoulders vertically. Different back muscles are stretched as a result. If a deeper rotation is necessary or preferred try holding the extended leg with both hands. Hook the elbow over the extended leg and apply force into the leg. This will provide even more rotation in the spine. 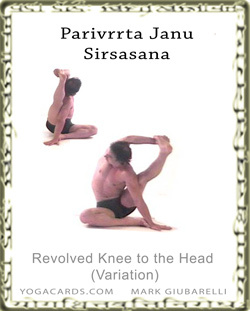 The above posture can be combined with the low version of Janu Sirsasana. This yoga posture stretches the toes and hamstrings in a different way.